Are you wild about film-making? Or do you want to share your passion for the environment with others? 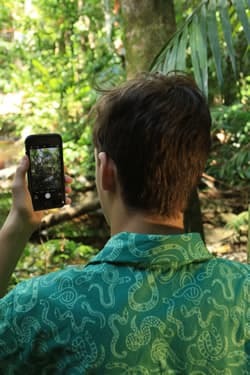 Sunshine Coast Council is calling all young aspiring Sunshine Coast film-makers and environmentalists to submit a short 2 minute documentary-style film featuring the Sunshine Coast's brilliant biodiversity. Shortlisted entries will be showcased through Council's Environmental Visitor Centres at the new Mary Cairncross Rainforest Discovery Centre theatrette. Competition winners will bag some awesome prizes including a GoPro camera and a priceless opportunity to undertake hands-on fieldwork with environmental scientists. Entries that focus on rainforest habitats are especially encouraged. The important dates: Entries open Monday 27th February 2017. You must also obtain written consent from anyone whose image or whose property appears in your film. (Consent forms are available to down load here and completed forms should be uploaded along with your film). Make sure you read the terms and conditions of the competition, you will need to agree to these when you submit your entry. Your parent or guardian needs to give permission for you to enter the competition. If your film is shortlisted, we will give them a call to confirm they have read and agree to the competition terms and conditions (hyperlinked to another page). To enter you need to read and agree to the terms and conditions of the competition. Ask a parent, teacher or guardian to explain these to you if you do not understand. You must not break any laws in the production of your film, this prevents you for example from handling wildlife or invading people's privacy. Your film must not infringe copyright legislation, this means that you may not be able to use images, music, script that is not your own original work. Your film must respect people's privacy, this means that you must obtain permission to enter or film on another person's property and anyone whose image or property appears in your film must provide written consent for this. Consent forms are available for you to download here. Save your film in a format that can be played on any computer (for example the end of the file name should be .mov, .mp4 or .wmv and NOT .wlmp). We strongly recommend that you send your film to a friend or teacher and ask them to check it for you before you submit it. It is a good idea to name your video file with your first and last name, example: Jane Smith.mp4. Get the link to your uploaded file and paste it below so that we can download your video file. Make sure that you have set permissions on the link so that it can be downloaded by anyone you choose to give the link to. Please contact Council's Environmental Programing Officer on cclp@sunshinecoast.qld.gov.au if you have any questions about submitting your entry.